I have just finished writing up the pattern for the "New Angle" bracelet! I had planned on saving this one for a book I wanted to write. However, with our precarious situation, I decided to go ahead and write it up now. I will just have to come up with new designs for that book (if I ever the opportunity to write it)! Simple Elegance. "New Angle" presents an opportunity to practice Double Half-Hitches. Recommended for intermediate knotters or beginners who catch on fast. It is not a complicated design (except the transition to the button hole). It is just a bit tricky getting the knots to be uniform. This pattern includes instructions for Version "A" (the green, red, and gold bracelets with bugle beads) and Version "B" (the lime and yellow bracelet with faceted round focal beads). Materials list is for an 8 inch bracelet. "Categories" in sidebar. 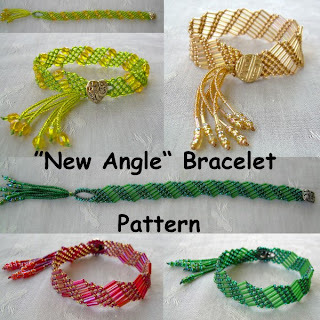 Scroll to this "New Angle Bracelet Pattern" listing to find or post applicable comments. Or, you may contact me directly (email address also included in pattern). My Etsy Shop in the "Just the Patterns" section. My ArtFire Studio in the "Patterns" section. "Finish off each strand with an OH (Overhand Knot), dot with glue, let dry, and trim the ends." I have made the correction to the pattern, but for those of you who already bought the pattern, I wanted to let you know.